Limited Edition Blue & Yellow Half/Half Colored Vinyl. 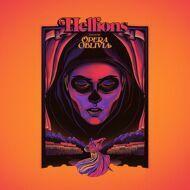 The album that catapulted Hellions into the international press, Opera Oblivia has been repressed on strictly limited rich blue & yellow half / half vinyl to match the gorgeously theatrical artwork. With fan-favourites such as Quality Of Life and the phenomenal Thresher, it's the album that justified the hype and set Hellions on the path to legendary greatness.